What homeowners need to know when hiring an insulation contractor or installer. 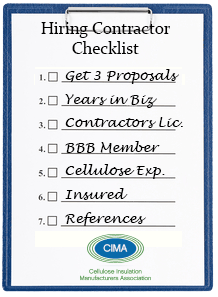 CIMA has prepared an outline to help assist homeowners in the process of selecting and hiring the most qualified insulation contractors and obtaining competitive proposals. See the basic steps below and download a PDF copy. A contractor referral service is also available here on the website. Get three (3) proposals with estimates in writing. Ask for information to verify qualifications, contractor license, insurance, etc. Ask the contractor to provide a list of references and call to verify their work.